It was August 25th, 1858. The night before had been dark and stormy, but this one was moonlit and clear. Francisco Morales and María Pérez were traveling on the road to Guadamar with their daughter Escolástica and a donkey when they reached the Guarrazar spring six miles outside Toledo. While answering the call of nature, Escolástica spied under the white glimmer of the moonlight a square hole barely covered with two flat stones. In the gap between them something shone gone. That something turned out to be a priceless treasure of gold crosses, goblets and other objects festooned with precious stones, pearls and glass. Francisco, María and Escolástica dug up everything they could find, rinsed the artifacts in the spring and quickly made off with their ill-gotten gains. They didn’t know it, but they weren’t alone that night. Domingo de la Cruz, a gardener who owned an orchard near Guarrazar spring, had observed them digging up buried treasure. The next night, he went back to the site and did some of his own digging, finding a second, smaller collection of treasure. He too made off with it. Nobody told the authorities. It was a hideous free-for-all. Within days unusual gold begemmed pieces began cropping up in the shops of Toledo’s famed gold and silversmiths. Many of them were broken up, melted down and reused making them untraceable. It’s said that one smith was so torn over what to do with a unique gold dove that he threw it in the Tagus. Gemstone trader José Navarro took a different approach. 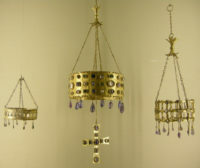 He had a yen for archaeology, so he bought numerous fragments and painstakingly pieced them back together, reconstructing the votive crowns commissioned by Visigothic royalty as donations to the Church, royals that can be identified with precision because pendant letters spell out the name of the exalted donors. Navarro did all this work under strictest secrecy. 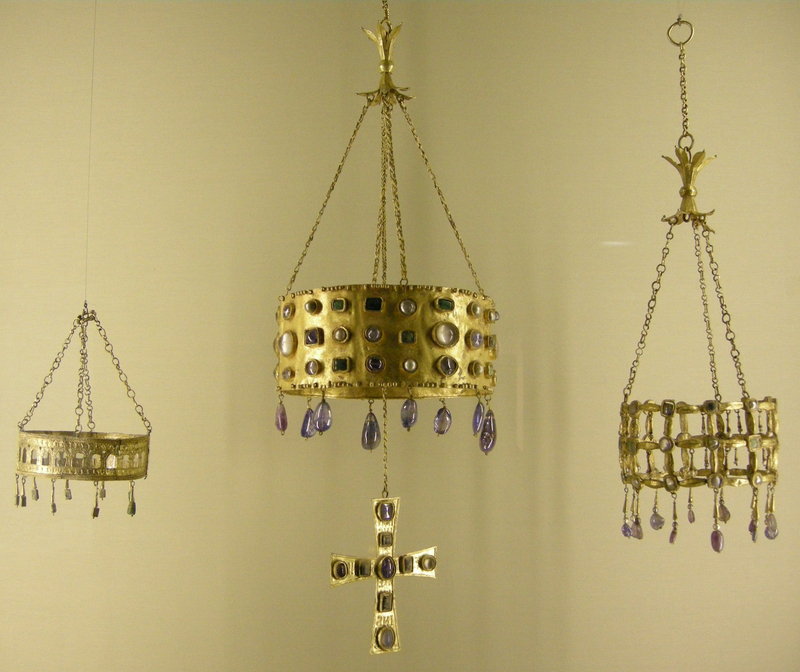 In 1859, his work as complete as he could get it, Navarro sold the crowns, pendants and assorted pieces to to Edmond Du Sommerard, director of the Musée National du Moyen Âge in Cluny, France. That’s when the news of this exceptional discovery finally broke wide. Cluny published their acquisition in the scientific press and Spain was horrified to discover that incalculably precious cultural patrimony had been found only after it was lost. The Spanish government repeatedly demanded that France return the treasure, but was blown off by Napoleon III and subsequent governments. José Amador de los Ríos, art historian, archaeologist and a pioneer in recognizing the literary and artistic wealth of Medieval Spain, was enlisted to excavate and document the find site in 1859 after the treasure had made headlines. He found a few loose pearls and gemstones that had fallen off the jewels, graves, some architectural remains and lots of evidence that the site had been thoroughly picked over by local looters who had heard about the treasure through the gossip mill. It was Ríos who recognized that while the form of the votive crown and the decoration were of Byzantine design, the pieces were manufactured locally. The conventional wisdom among European historians at that time was that Spain was a penurious backwater in the early Middle Ages and that the splendors of the Visigoths which had so astounded the Umayyad conquerors who took Toledo in 712 A.D. had to have been Germanic in origin. In 1861, a very nervous Domingos de la Cruz went to the Royal Estate of Aranjuez where Queen Isabel II was staying and offered her majesty what was left of the treasure he’d discovered. Much hemming and hawing and hypothetical “if somebody happened to have purloined gold Visigothic treasure a few years back and wanted to hand it in, would he get thrown in the dungeon or paid off?” kind of talk ensued. Queen Isabel agreed to accept the remaining treasure — including the votive crown of King Suintila (r. 621-631) — and give Domingos de la Cruz a fabulous pension of 4,000 reals a year in return. The Suintila crown was stolen in 1921 and has never been found. Cluny kept Guarrazar’s Visigothic treasure for 80 years until Heinrich Himmler stepped into the picture. In 1941, with France under Nazi occupation, Himmler returned most of the treasure to fellow fascist General Francisco Franco. 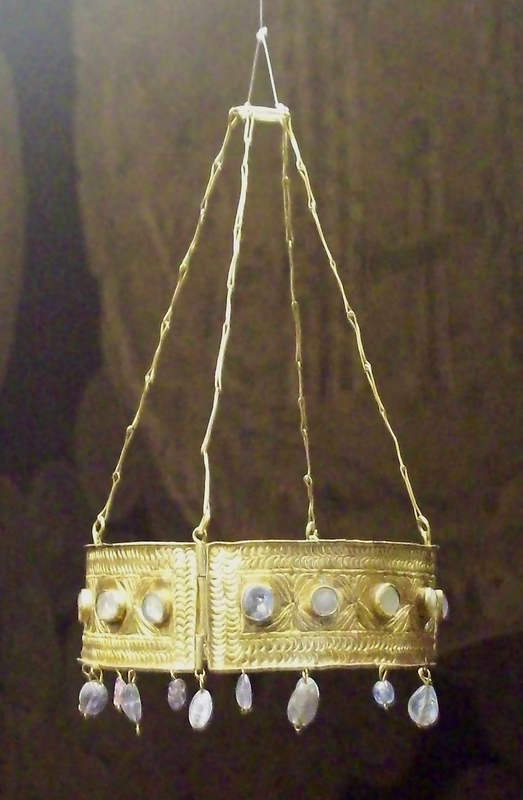 Six votive crowns, a goblet and crosses are now in the National Archeological Museum in Madrid while the Cluny Museum still holds three of the crowns and a few smaller objects. The Royal Palace in Madrid has one crown left. With all the loss that has bedeviled Spain’s greatest Visigoth treasure since it was discovered, proper scientific study was long in coming. The first comprehensive study took place in 1995 and revealed that the gemstones traveled great distances. The cabochon sapphires are from Sri Lanka. The emeralds are from the Austrian Tyrol. The question of why they had been buried in the first place was still open, however. Historians speculated that the priceless religious artifacts had been secreted in consecrated graves to keep them safe from the invasion force of Táriq Ibn Ziyad. Spanish archaeologist Juan Manuel Rojas found this explanation wanting. With the help of the Guadamur City Hall, Rojas embarked on an investigation that led to the establishment of an archeological site that the public can now visit. During recent years, the walls of a building more than 30 meters long have been unearthed as well as a basilica, the remains of what appears to have been a palace, a Visigoth graveyard and even a guest house for pilgrims. Rojas’ research has led to the revelation that the place where the treasure was hidden was not a field at all but a religious complex not unlike the one at Lourdes, France, with its own healing water that sprung from the well where Morales cleaned the jewels. So, far from being buried in an ignominious field, the royal treasure had been hidden in a prestigious site whose own ceilings were decked with votive crowns. When its occupants found out about the unstoppable advance of the Muslim and Berber forces, they sought somewhere to hide the jewels and decided on the graveyard. Raising two tombstones, they removed the bodies, buried the treasure, covered it with cloths and sand and put the corpses back on top. When Escolástica went to relieve herself at the spot more than 1,000 years later, she ducked behind what had once been the wall around the cemetery. You can see the crown of King Reccesvinth (649-672) in a 3D scan here, another votive crown here and a third here. I regret to inform you that the 360 degree views of the crowns requires Flash to run, but the resolution is great and there are a paucity of good images of the treasure out there, so it’s worth the annoyance to check them out. This entry was posted on Monday, January 21st, 2019 at 11:54 PM	and is filed under Looting, Medieval, Museums. You can follow any responses to this entry through the RSS 2.0 feed. You can skip to the end and leave a response. Pinging is currently not allowed. Best “It was a dark and stormy night…” column so far this year. Indeed. However (and already sorry for that), Arrgh (a medieval one, of course). Having upgraded over here, and having ‘visigothed’ the Flash-plugin for good, and in addition to all this, it now turns out that ‘ttf-ancient-fonts‘ is not installed, and Gothic letters are not displayed without it! PS: On the Gothic Wikipedia (got.wikipedia), there is an article about the king’s own dad in Gothic letters, and his name is ‘Chindaswinth’ (Chindasuinth – no ‘double -u’). Can anybody read that? (personally, I could not, i.e. not until ‘ttf-ancient-font’ is installed). There is a Visigoth museum in Toledo. It had King Recciwenith’s crown. It is actually sized for a human head. I had always thought it was huge, but no, it’s human scale. It is a true wonder. Sorry for being a nitpicker, but the museum is not in Cluny: in fact it is in Paris. It is called the museum *of* Cluny because it is situated at the “Hôtel de Cluny” (very roughly “Cluny palace”).